Responding to the diverse needs for genetic testing -New release of reagent kit enabling simultaneous measurement of several genetic mutations- | ARKRAY, Inc.
ARKRAY, Inc. shall release the genetic analysis kit i-densy Pack Multitype UNIVERSAL as a dedicated reagent (for research use) for the i-densy Gene Analyzer on 30 March, 2017. Responding to the diverse needs for genetic testing, a maximum of 12 items can be easily and rapidly analyzed all at the same time. 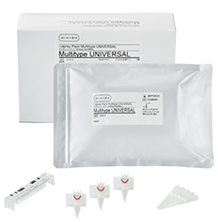 The i-densy Pack Multitype UNIVERSAL released by ARKRAY, Inc. (hereafter, 'ARKRAY') is a cartridge-type reagent that enables easy and rapid genetic analysis using whole blood or purified nucleic acid as the sample. Previous genotype determination was a complicated, manual procedure and very time-consuming. But by using the i-densy IS-5320 Gene Analyzer and i-densy Pack Multitype UNIVERSAL , easy operation has been achieved wherein only the sample, primers and probe are set with no need for sample pre-treatment or gene amplification. Furthermore, in response to the requests of research institutions, the kit allows for flexible reagent design so that desired target genes can be chosen without restriction. Since a maximum of 12 items can be simultaneously measured, which is 4 times as much as the previous product*, this product shall serve to address the diverse needs for genetic testing, such as simultaneously measuring several mutations of the same gene and simultaneously measuring several different genetic mutations. ARKRAY will continue to actively undertake research and development into gene analyzers and reagents as well as the provision of information in order to further support personalized medicine.  Easy and rapid measurement of maximum 12 items. With easy operation requiring only the setting of sample, primers and probe, genetic analysis can be performed for a maximum of 12 items at once. Furthermore, the measurement items can be customized based on user needs. Several mutations of particular genes can be simultaneously detected. From major mutations to minor mutations, comprehensive analysis has been realized.  Simultaneous measurement of several disease-related gene mutations. Based on user needs, a combination of several disease-related genes can be selected without restriction and detected. ＊Reaction tube and dispensing tip are sold separately. This analysis kit is intended for research purposes. Measurement results cannot be used to diagnose or to assist in diagnoses. 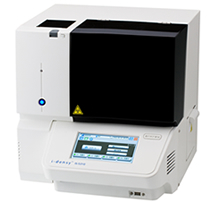 The i-densy IS-5320 is a desktop instrument for the fully-automatic analysis of base pair sequences associated with drug metabolism and cancer related genetic mutations. It does not require a high degree of technical skill to operate and all steps from sample pre-treatment to gene amplification and genotyping are simple. Where previously it took many days from sample collection to output of results, genotyping now takes 80 minutes. ARKRAY first released the IS-5320 back in 2012 followed by the release of the in vitro genetic reagent i-densy Pack UGT1A1 (*28/*6) in January 2014 and i-densy Pack CYP2C19 in March 2016. ARKRAY continues to support personalized medicine through the development of associated products. This product will be sold through ARKRAY Marketing, Inc. (ARKRAY, Inc.'s distributor in Japan). Sales except Japan to be determined.